CarGurus has 11,181 nationwide Civic Coupe listings starting at $1,995. After an unusually disappointing ninth-generation Civic, Honda's really going at it full force with the tenth-generation car. After unveiling the 4-door sedan, Honda followed up with the much-anticipated 2-door coupe version at this year’s L.A. Auto Show. Honda teased a Civic Coupe concept at the New York Auto Show earlier this year, and the production version is thankfully quite close to it. Considering that this is a mass-market economy car, the 2016 Civic Coupe really is an attractive machine. From the A-pillar forward it’s the same as the sedan but 1 inch lower, and from there back it has the sloping roofline you’d expect from a coupe, and it even has a rear spoiler. That’s something that for the most part had been previously reserved for Si performance models. Speaking of performance models, Honda will apparently offer both an Si and a Type-R version of the tenth-generation Civic in the future, as well as a 5-door hatchback. The new Civic Coupe also has LED daytime running lights and LED taillights standard, which go well with the new body’s sharp creases, and 2016 Civic customers will be able to choose from nine colors, including Aegean Blue Metallic, Burgundy Night Pearl, Cosmic Blue Metallic, Crystal Black Pearl, Lunar Silver Metallic, Modern Steel Metallic, White Orchid Pearl, Taffeta White, and new-for-2016 Rallye Red. 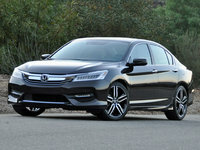 The powertrain in the coupe will be the same as the sedan's for now, meaning buyers will get a choice of either a normally aspirated 2.0-liter VTEC 4-cylinder that makes 158 hp or a 1.5-liter turbo four (Honda’s first turbocharged engine in the U.S. market, if you don’t count Acura) that makes 174 hp. The turbocharged engine is available only with a continuously variable transmission (CVT), which is designed more for efficiency than for driving pleasure, while the 2.0-liter engine can actually be had with a 6-speed manual in the base trim. Fuel economy for the sedan is expected to be 40+ mpg for most models, so we can expect the coupe to do at least that well. While the details about the 2016 Civic aren’t all that reassuring for people who take their driving a little more seriously, they will be relieved to know that an Si version will eventually arrive to take up Honda’s place in the sports compact market, and there's even talk of bringing a Civic Type-R to the U.S., which would make it the first Type-R to come to America since the last Integra Type-Rs arrived in 2001. Compared to the car it replaces, the 2016 Honda Civic Coupe has a larger footprint, a lower seating position for a sportier feel, and an extra 8.4 cubic feet of space inside. The body is also significantly more rigid while weighing less. An electric parking brake and automatic climate control are standard (dual-zone climate control is available on higher trims), and various parts of the interior have LED lighting. Overall, the look of the interior appears to have a much more premium feel to it than the old ninth-gen car. The 2016 Civic Coupe will also come with Honda’s new Android-based infotainment system with a 7-inch touchscreen display and both Apple CarPlay and Android Auto capability. Garmin-developed built-in navigation is also available as an optional extra. The last Civic earned 4 out of 5 stars for crash testing with the NHTSA, so given the amount of effort they’ve put into the 2016 model everywhere else, we can expect it to improve in the safety department as well. Collision-Mitigation Braking, Road-Departure Mitigation, and adaptive cruise control will be standard in 2016 versions, while a rear-view camera will be an optional extra. Honda has already called this car “the most ambitious remake of Civic we’ve ever done,” and after the rare blow to the Civic’s reputation with the last generation, it needs to be. The Civic does have some ground to make up in a market it previously dominated, and this coupe version of the tenth-generation 2016 model completes the lineup that began with the introduction of the sedan a few months ago. It therefore should be able to reinvigorate the Civic’s image here in the all-important U.S. compact market, even as it remains fiercely competitive. 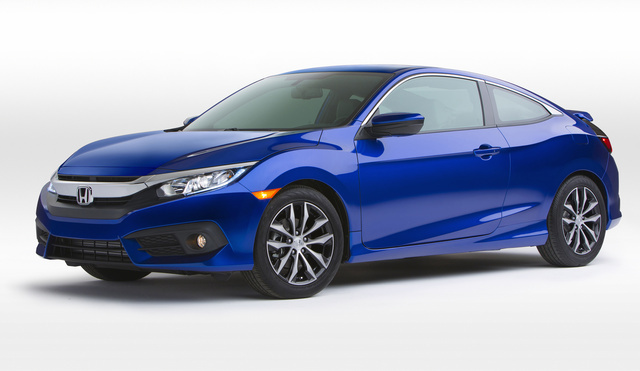 What's your take on the 2016 Honda Civic Coupe? Have you driven a 2016 Honda Civic Coupe? If my iPhone has a virus and if I connect it to hands free link Bluetooth system on my 2016 Honda Civic Lx-p, will the audio system get affected in any way? If I connect my iPhone that has a virus through Bluetooth into my civic 2016 Lx-L's hands free link Bluetooth system, will a virus get into the audio system?